(St. John’s, Antigua )Ten German travel agents converted their theoretical knowledge of Antigua & Barbuda into practical experience when they visited the island last week. Prior to their visit the agents had successfully completed the destination e-learning programme created by the Antigua and Barbuda Tourism Authority’s German Office and were selected from amongst ninety agents who achieved full scores during the programme’s final online quiz. The e-learning programme received industry recognition after winning the Globus Award 2009 for being voted as one of the best destination courses for travel agencies. 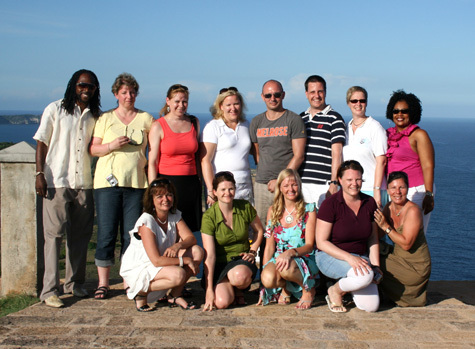 The group was hosted by Galley Bay Resort and Spa, The Verandah Resort and Spa and Hawksbill by Rex Resorts. In addition, to experiencing first-hand the services and products offered by the host properties, the agents carried out comprehensive site inspections of the majority of hotels sold by German Tour Operators. An exploration of Antigua via a safari, a catamaran cruise with Tropical Adventures, and a trip to Sting Ray city featured on the group’s Itinerary. Agents also got a spicy taste of Antigua’s cuisine during a visit to the kitchen of the maker of Susie’s Hot Sauce. “The combination of product information and local experiences made this fam trip very special and remarkable. I will sincerely do my best to send as many clients as possible to this little paradise,” stated one of the agents after the trip. The flight was made possible with the assistance of German airline Condor, that offers a weekly direct flight from Frankfurt to V.C. Bird International Airport.